Lab created opal ring with black onyx handcrafted in sterling silver by Hileman Silver Jewelry. The ring has five pieces of lab created opal separated by 4 pieces of black onyx. The lab created opal is a nice blue-green with lots of fire. Special care was taken when selecting and cutting the lab opal to make it look as much like natural opal as possible. The lab created opal in this ring is a top quality synthetic opal grown under laboratory conditions. The manmade opal's chemical composition is the same as natural opal with the exception of water content. Australian opal contains about 4% water and lab created opal contains no water. Instead the water is replaced with resin. The resin gives the synthetic opal more durability and helps to resist cracking. Laboratory grown opal gives you all the fire and colors of top grade natural opal at a much more affordable price with increased durability. This stunning lab created opal wedding ring measures about 10mm wide at the top with a slight taper toward the bottom. This ring will be made to order in your ring size in 4 to 6 weeks- depending on the work load. This ring is style number M210ssLabOpalOnyx. 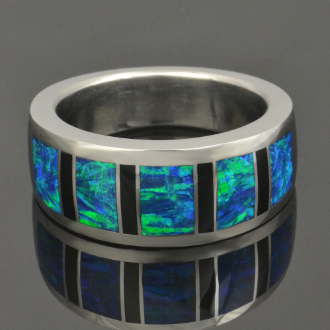 A matching woman's band (or gent's) could be made to make a nice lab opal wedding ring set.